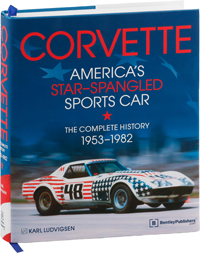 Corvette - America's Star-Spangled Sports Car now on sale - order your copy today! After a terrific and well-received launch at the 2014 Bloomington Gold Corvette show and just in time for the 4th of July, we're happy to announce that Corvette - America's Star-Spangled Sports Car by Karl Ludvigsen is now available and shipping today! Look for it here on BentleyPublishers.com or wherever Corvette books are sold. For a preview of what you'll find in Corvette - America's Star-Spangled Sports Car, check out the September 2014 issue of Corvette Magazine on newsstands now. In it, you'll find an exclusive excerpt of Chapter 35 - "Winchell's Raiders" where Ludvigsen tells the back story of the Chevrolet engineering team in the mid-'60s with recollections of Frank Winchell, Zora Arkus-Duntov and their discussions of the Corvette's engine placement.